John Barr Clark, circa 1870. Photo courtesy of Christopher D. George. Little did the elders and members of the Second United Presbyterian Church of Allegheny City, PA , know what they were getting themselves into during the summer of 1860. Being “destitute of a fixed Pastor,” a call was made for Rev. John Barr Clark, then a little-known minister in Canonsburg, PA, to lead the church and take “charge of our souls.” Soon after Rev. Clark accepted this new pulpit, he and the more than 250 members of Second U. P. would feel the winds of change that were blowing about the country. It wasn’t long after Rev. 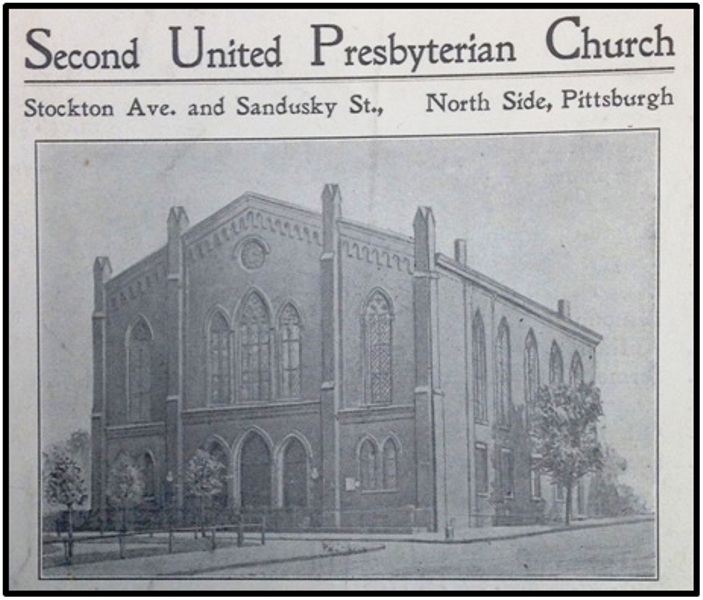 Clark’s first sermon in Allegheny City (now the North Side of Pittsburgh) that the fragile bonds of our divided country began to tear at the seams. After the election of Abraham Lincoln, the secession of several southern states, and the firing of guns at Ft. Sumter , the United States went to war with itself. By the summer of 1862, it became clear to most that this war was not going to end quickly. The North, plagued by poor military leadership and mismanagement, realized the grim fact that more soldiers would be needed to end the Southern rebellion. In early July of 1862, President Lincoln called for an additional 300,000 volunteer soldiers . This call, like the one that summoned Rev. Clark in 1860, would have a significant impact on Second U. P. of Allegheny. As news of President Lincoln’s request for troops reached the northern states, Governor Andrew Curtin  made it known that Pennsylvania was responsible for supplying 21 new regiments (approximately 21,000 soldiers) from across the commonwealth. Recruitment efforts were put into action all over the state, with one of the largest gatherings taking place on July 25, 1862, not far from the front door of Second U. P. of Allegheny. Whether or not Rev. John B. Clark attended “The Great Mass Meeting” that day, he soon took recruitment matters into his own hands, holding an August 5, 1862 “war meeting” in the basement of the church to encourage the men of his congregation to enlist in the northern army. He believed so strongly in the fight to preserve the Union that he signed his name at the top of the muster roll, stating that his goal was to be the captain of a company (approximately 100 men) of "Christian soldiers." The timing of Rev. Clark’s meeting could not have been better planned to serve as a catalyst for volunteer enlistments. The powerful patriotic forces swirling about Pittsburgh, Allegheny City, and Pennsylvania were finally at a tipping point, owing to four primary factors. First, the Lincoln administration had announced that any state not meeting its required quota of soldiers from the President’s call would be subject to a draft. Second, a nine-month term of service had been offered to the young men of Pennsylvania and other northern states to encourage enlistments. Third, an announcement was made that this shorter term of service would only last until August 10, 1862, at which time enlistments would revert to the typical three-year commitment. 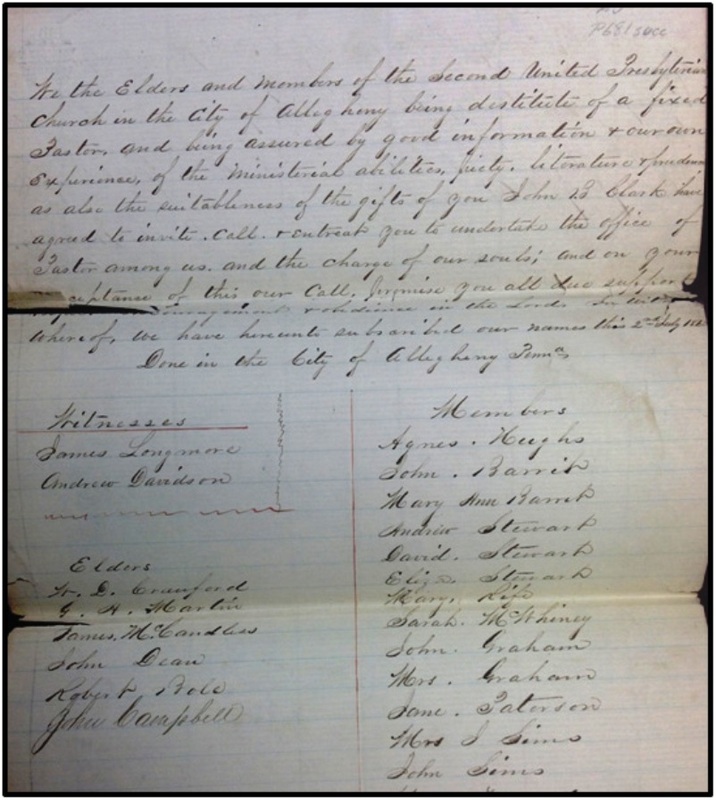 Fourth, the citizens of Allegheny County had collected donations to pay any volunteer a $50 bounty at the time of enlistment. Added to these incentives was the fact that the Pittsburgh newspapers had started to write about a “company of Presbyterians” forming under the Christian leadership of Rev. Clark. The combination of these forces and the lure of being led by a minister brought about the formation of an entire regiment (roughly 1,000 men) in a little over seventy-two hours. The Civil War adventures of what would be known as the 123d Pennsylvania Volunteer Infantry , now under the leadership of Colonel Clark, had officially begun. As this regiment of “Christian soldiers” left the Pittsburgh area in the summer of 1862 to the shouts and tears of family and loved ones, it was anxious to face the unknown and bring the war of rebellion to an end. Their nine-month journey, although shorter than most, came at possibly the darkest time for the North. These farmers, carpenters, clerks, and bricklayers would witness the horrific aftermath of the second Battle of Bull Run , lock eyes with death itself at Fredericksburg , and fight for Chancellorsville  (all Northern losses) before being mustered out in May 1863. Some of the men would reenlist and continue the struggle; others would hear of the success and glory of the Battle of Gettysburg  while back at home. Those fortunate enough to return to the environs of Pittsburgh and Allegheny City went about constructing the rest of their lives and answering the calls of work, marriage, family, and the urge to gather with old comrades and relive their difficult days in the Army of the Potomac . The Presbyterian Historical Society and its vast archives have played a significant part in helping me tell the story of Rev. John Barr Clark, Second U. P. of Allegheny, and the men of the 123d Pennsylvania Volunteer Infantry who were connected to both. My sincere thanks goes to the dedicated staff of PHS and their willingness to help me and many other researchers tell the stories that have called out to be told. Christopher D. George , a graduate of the University of Cincinnati and the University of Pittsburgh, is a teacher in the Upper St. Clair School District near Pittsburgh, PA. An avid genealogist, he has spent nearly 20 years researching his great-great-grandfather, Pvt. John Armstrong George, and the rest of his fellow soldiers in the 123d Pennsylvania Volunteer Infantry. He previously published a family history titled The George Memory Book in 2008. For more information about Rev. John Barr Clark and the Civil War adventures of the 123d PVI, see the author’s Day-by-day with the 123d Pennsylvania Volunteers (2016) . The book chronicles the story of these men through their own words, genealogical research, and the extensive newspaper coverage that they received during and after their term of service in the Army of the Potomac.